I am conducting a Unique Hues Survey inspired by one of my favorite quotes from The Interaction of Color by Josef Albers. it can be expected that there will be 50 reds in their minds. The Red in Albers quote is just one of the four colors that are considered unique hues or psychological primaries. The others are Blue, Yellow and Green. These four colors play starring roles in color opponency theory which places visual complements, rather than pigment complements, opposite each other on a color wheel. Knowing pigment complements helps when you are mixing colors, knowing visual complements helps when you are choosing colors. Visual complements are what give a color scheme it’s punch! Since everyone sees different colors in their minds, there’s a wide range in the four colors defined as the unique hues. Look at the chart above. 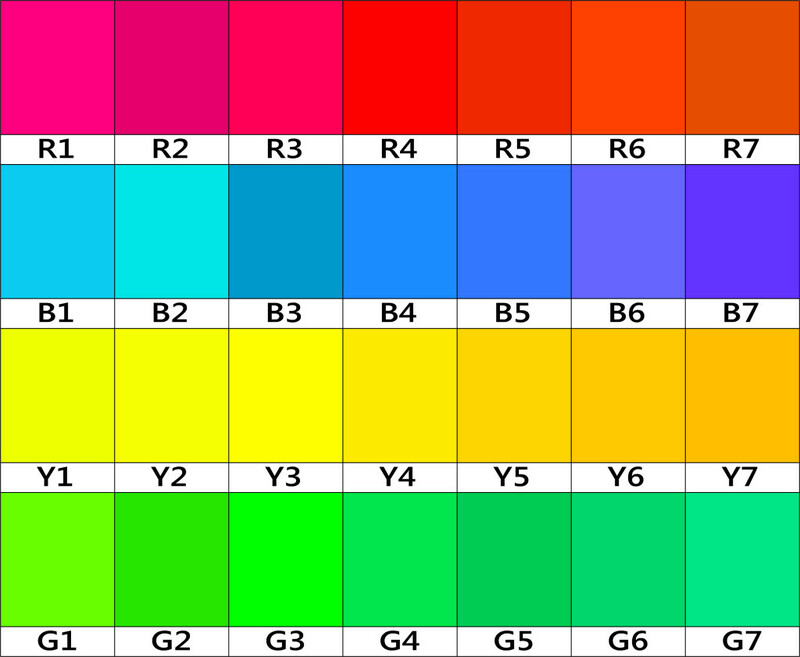 Which color swatches come closest to pure Red, Blue, Yellow and Green? Don’t overthink it! I need your first impressions, your first picks. You can let me know your choices by filling out a short survey online. The link is at Unique Hues Survey. The colors on the chart above will look different depending on many factors including: the type of device you are using to read this article, the calibration of your screen, and your viewing angle. Sage Bray, the publisher of The Polymer Arts magazine agreed to help out by printing a copy of the chart in the upcoming summer issue of the magazine. Imagine hundreds of readers looking at exactly the same color chart and responding to the survey. Now that’s cool!! You can fill out the survey using either the on-screen version, or the printed version, or both. I’ll share the data from the survey in a future post and in an article on Exploring Visual Complements for the fall issue of The Polymer Arts magazine. A Little Thank You Note: I’m very curious about the results so the more responses the better! Everyone who completes the survey will be entered into a drawing for a chance to win a series of three, fun, one-hour Discovering Your Color Voice studio lessons with me on Skype. You can only take the survey once but you can ask your family and friends to look at the chart and fill out the survey on their computer. Just ask them to fill out the last question with your your email address for more chances to win. Thanks!